Allied Instrument Service manufactures premium custom built control panels to your specifications. We pay attention to every detail. Components are chosen based on our customer’s application requirements. At Allied Instrument Service we specialize in Temperature Control Panels, Mold Junction Boxes & Power Control Panels. From one to one hundred zones we can take care of your needs. We have in-house metal fabrication capabilities, including drilling, tapping, punching and cutting. Also, our extensive network of solid vendors for fabrication, cutting, bending and finishing enable us to deliver anything you require. 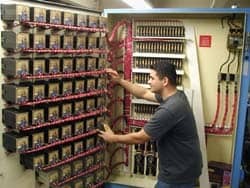 We perform complete panel assembly, including low and high-voltage wiring, controls and components mounting, sub-panel assembly, and nameplate engraving. Single and Multiple Zone Process, Timer and Temperature Control Panels Precise zone temperature control with fully programmable process controllers, protected circuitry and quick disconnects. Temperature Control Panels are self-contained completely wired and ready to use. Simply attach your heater, power wiring, and thermocouple (not included) and your ready to run.